Reflecting the will expressed by His Holiness the Pope, though the changes brought by him to our Church, it was found necessary to update the canonical publications which serves as rules and guidelines to the armed faithfuls serving the Church. Indeed, publishing these rules will serve to protect the community of faithfuls from the errors of mankind. To err is human, but to break rules is a conscientious act. So that we may see an active and modernizing Holy Aristotelian Church, we have ruled and ordered, and by our present perpetual and final edict, say and order the publication of the Canon 5.2.IX. The new publication will be available in the Roman Library, alongside the Book 5.2 (FR), as well as an annex to the current announcement. Sanctae Romanae Ecclesiae Cardinalis Archidiaconus. Given in Rome on the XXIXth day of the IIIrd month of the Year of our Lord MCDLXVI. Papal Bull « The Congregation of the Holy Armies ». The Congregation for the Holy Armies intends to coordinate the armed faithfuls and milites who serve the Church and the Faith to fight against the corruption of the Nameless beast. As such, a set of rules applicable to mobilization in time of war and peace are to be implemented. This new codification takes precedence over all older Canons of the Holy Armies, unless specified otherwise. Article 1 The Congregation of the Holy Armies cannot intervene directly in armed conflicts, unless a formal declaration of War has been published. Article 2 Individual members of the Holy Armies are allowed to intervene in local conflicts by their own free will, in order to protect a city or province from sinners, malicious brigands or heretics. They cannot act as members of the Congregation during this unsanctioned mobilization, and must respect any relevant Canons. As such, the member remains subject to the rules of his Order, and must withdraw from the local conflict if asked by his superiors or by the Congregation. Article 3 Members of an Allied Aristotelian Order are allowed to intervene in local conflicts by their own free will, in order to protect a city or province from sinners, malicious brigands or heretics. They cannot act as members of the Congregation during this unsanctioned mobilization. Article 4 Members of Military Religious Orders are allowed to intervene in local conflicts by their own free will, in order to protect a city or province from sinners, malicious brigands or heretics. They cannot act as members of the said Order, or of the Congregation, during this unsanctioned mobilization. Article 4.1 Members of Military Religious Orders are forbidden from entering armies lead by foreign powers, unless this army is to act in an defensive nature, and the member has gained the written permission of his Grand Master. Article 5 Members of the Episcopal Guard are allowed to intervene in local conflicts by their own free will, in order to protect their diocese from sinners, malicious brigands or heretics. They cannot act as members of the Episcopal Guard during this unsanctioned mobilization. Article 5.1 Members of the Episcopal Guard can only participate if in possession of a written permission from his Diocesan Lieutenant, Episcopal Captain or local Vidame. The Prefect of the Vidames of the Episcopal Guard can also issue a permission. Article 6 Any written permission must be delivered to the Cardinal-Constables of Rome within two days. The permission may be approved or vetoed at anytime. Article 7 Any vetoed permission must be respected within two days, or sanctions may be enacted against the faulty member. Article 8 The written permission may also be directly delivered by one of the Cardinal-Constables of Rome. Article 9 A time of Peacekeeping is declared when an Aristotelian Province or City is in dire need, preyed upon by sinners, malicious brigands or heretics. The Congregation publicly announces the armed intervention as a time of Peacekeeping. Article 10 The Peacekeeping mission will be under the sole responsibility of an appointed Gonfalonier of the Church, whom reports and answers only to the Cardinal-Constables of Rome for the duration of the peacekeeping mission. Article 10.1 The Gonfalonier of the Church is appointed publicly by the Cardinal-Constables of Rome. Article 10.2 The appointee must be a baptized faithful of good reputation and morals. Article 10.3 The appointee must be part of the Holy Armies, a derivative branch, or possess extensive military training. In Addition, he must be accredited by the Academy of Holy Armies. Article 10.4 The appointee must understand the local language of the Peacekeeping mission. Article 10.5 The appointee has full logistical and military powers in his zone of mission, coordinating with the Holy Armies the troops, budget and donations. Article 10.6 The appointee may form a Council of advisors inside the walls of the Congregation, inviting the local primate, bishops, and diocesan constables, as well as members of the Holy Armies, Episcopal Guard and Pontifical Nobility. Other collaborators may be added as necessary, such as Pontifical nobles, under approval of the Cardinal-Constables. Article 10.7 The appointee cannot use his rank or power to enrich or benefit himself. Article 11 The authority of the Gonfalonier of the Church extends only as far as the authority delegated by the Cardinal-Constables of Rome. Article 12 The Gonfalonier of the Church acts, within the zone of peacekeeping, as the principal leader. He coordinates all active troops involved in the mission, but remains subject to the authority of the Cardinal-Constables of Rome. Article 13 Members of an Allied Aristotelian Order, residing within the zone of peacekeeping, are expected to cooperate and participate in the efforts, placing themselves at the disposition of the Congregation and of the Gonfalonier. Article 14 Members of Military Religious Orders, residing within the zone of peacekeeping, are obliged to cooperate and participate in the efforts, placing themselves at the disposition of the Congregation and of the Gonfalonier. Article 15 Members of the Episcopal Guard, of the dioceses within the zone of peacekeeping, are obliged to cooperate and participate in the efforts, placing themselves at the disposition of the Congregation and of the Gonfalonier. Article 16 The local members of the Clergy are expected to help the efforts with donations, prayers and holy masses. Article 16.1 Likewise, anyone may volunteer logistical or military support, placing themselves at the disposition of the Congregation and of the Gonfalonier. Article 17 The Gonfalonier of the Church can be relieved from duty at any time by the Cardinal-Constables of Rome. Article 18 The time of Peacekeeping can be declared as resolved at any time by the Cardinal-Constables of Rome, thereby also automatically relieving from duty the Gonfalonier of the Church. Article 18.1 Upon resolution, all troops and unused money or logistics are to be returned equally to all contributors. Article 18.2 Pillaging is forbidden under penalty of military trial. Article 19 If multiple time of Peacekeeping are declared, multiple Gonfalonier of the Church can be named. Each mission remains independent from the other. Article 20 The rank of Gonfalonier of the Church may be granted multiple times to the same individual, preferably without accumulating active missions. Article 21 A time of War is declared when the Aristotelian Faith is in danger, as a response to a formal declaration of war by a foreign power or by an announcement following military actions taken against the Church. The Congregation publicly announces the armed intervention as a time of War. Article 22 The efforts of war will be under the responsibility of an appointed Gonfalonier of the Church, whom reports and answers only to the Cardinal-Constables of Rome for the duration of the mission. Article 22.1 In time of War, the Gonfalonier has the same duties and tasks as described in articles 10 to 12. He is the sole leader in a local conflict, and an adjunct in case of a wide-spread conflict. Article 23 If the area of conflict is deemed as being to large, the Constable-Cardinals of Rome may instead appoint a Captain General of the Church as the leader of multiple Gonfaloniers, whom reports and answers only to the Cardinal-Constables of Rome for the duration of his mission. Article 23.1 The Captain General of the Church is appointed publicly by the Cardinal-Constables of Rome. Article 23.2 The appointee must be a baptized faithful of good reputation and morals. Article 23.3 The appointee must be part of the Holy Armies, a derivative branch, or have successfully acted as Gonfalonier during a Peacekeeping mission. In Addition, he must be accredited by the Academy of Holy Armies. Article 23.4 The appointee must understand and speak English, preferably being multilingual, for the purpose of coordination. Article 23.5 The appointee has full oversight on the logistical and military organization of the war, coordinating with the Holy Armies the troops, budget and donations. He must also coordinate with local Gonfalonier if applicable. Article 23.6 The appointee may form a Council of advisors inside the walls of the Congregation, inviting the adjunct Gonfaloniers, local primate, bishops, and diocesan constables, as well as members of the Holy Armies, Episcopal Guard and Pontifical Nobility. Other collaborators may be added as necessary, such as Pontifical nobles, under approval of the Cardinal-Constables. Article 23.7 The appointee cannot use his rank or power to enrich or benefit himself. Article 24 When a Captain General of the Church is named, multiple Gonfaloniers of the Church may be named as his adjuncts, acting as subordinate leaders in a defined area. They have the same duty and missions as a time of Peacekeeping Gonfalonier, with the exception that they now report to the Captain General and cannot form a Council of advisors if acting as an adjunct. Article 24.1 The authority of the Captain General of the Church extends only as far as the authority delegated by the Cardinal-Constables of Rome. Article 24.2 The Captain General of the Church acts, within the zone of War, as the principal leader. He coordinates all active troops involved in the mission, delegating as necessary to his adjuncts. His decisions are above those of his adjuncts, but remains subject to the authority of the Cardinal-Constables of Rome. Article 25 All members of the Congregation have the obligation to answer to the mobilization in a time of War, according to the Canon Laws, and must join the Holy Armies. Failing to do so without justification may warrant a military trial. Article 26 All nobles of the Papal States have the obligation to answer to the mobilization in a time of War, according to the Canon Laws, and must join pontifical ban. Accordingly, the pontifical ban will assist the Holy Armies. 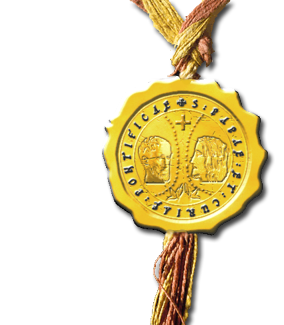 Failing to do so without justification may warrant heraldic repercussions at the discretion of the Pontifical Colleges of Heraldry. Article 27 Members of the Clergy within the zone of war are required to help the efforts with any means possible, may it be donations, prayers and holy masses. They may also accompany the troops, but must respect the Dogma's 17th Logion of Christos. Article 27.1 Likewise, anyone may volunteer logistical or military support, placing themselves at the disposition of the Congregation and of the Gonfalonier or Captain General. Article 28 The Captain General and the Gonfalonier of the Church may be relieved from duty, during the time of War, by simple decision published by the Cardinal-Constables of Rome. Article 29 The time of War can be declared as resolved at any time by the Cardinal-Constables of Rome, thereby also automatically relieving from duty any Captain General or Gonfalonier of the Church. Article 29.1 Upon resolution, all troops and unused money or logistics are to be returned equally to all contributors. Article 29.2 Pillaging is forbidden under penalty of military trial. Article 29.3 Volunteers and Milites participating in a time of War can be given compensation or rewards at the discretion of the Congregation of the Holy Armies, the Sacred College of Cardinals or His Holiness the Pope. Article 30 If multiple times of War are declared, a single Captain General of the Church can be named, but he can be assisted by multiple adjuncts. Article 31 If a time of Peacekeeping becomes a time of War, the originally appointed Gonfalonier may remain in function, be replaced, or can become an adjunct to a Captain General of the Church. Article 32 If a time of War is declared while a time of Peacekeeping mission is active elsewhere, the two missions remain separate unless a fusion is deemed necessary by the Cardinal-Constables. Article 32.1 In case of a fusion, the Cardinal-Constables will decide the exact restructuring necessary to ensure the smoothest possible transition, with the lowest amount of bureaucratic hassle. Article 33 The rank of Captain General of the Church, or Gonfalonier of the Church, may be granted multiple times to the same individual during successive declaration of the time of War. These ranks are not cumulative. Article 34 During a time of Peacekeeping or a time of War, the daily orders are transmitted to the participating volunteers and Milites using any method necessary for quick transmissions. Article 35 Under the authority of the Gonfalonier or Captain General of the Church appointed, volunteers will be organized in armed mobs or armed retinues. The leader of each group will receive the daily orders from the Gonfalonier or Captain General. Article 36 Members of Allied Aristotelian Orders, Military Religious Orders or of the local Episcopal Guard, will be organized in armed mobs or armed retinues under the leadership of the ranking member of each respective entity. The leader of each group will receive the daily orders from the Gonfalonier or Captain General. Article 37 Pontifical nobles will be expected to form their own armed mobs and retinues, or can join another groups if unaccompanied. The leader of each group will receive the daily orders. Article 36 The Gonfalonier or Captain General of the Church may create an Army, under which to regroup volunteers and Milites. If necessary, one or many Army Leaders can be appointed. Article 36.1 An Army Leader is a subordinate to the Congregation and to the Gonfalonier or Captain General of the Church. The Army Leader receives daily orders and transmits them to the armed mobs and retinues under his command. Article 37 A volunteer or Milites following daily orders is free of any blame for any actions that may happen. If part of an Army, he has the duty to leave and regroup with other forces should the Army Leader repetitively disobey daily orders. Article 38 An Army Leader disobeying daily orders is the only person who can be blamed of wrongdoing for the first two days. After the period of grace, if the Army Leader continues to defy daily orders, the volunteers and Milites still under his command can also be held accountable. Article 39 The Gonfalonier or Captain General of the Church is the sole responsible for any action taken by the volunteers and Milites who follow daily orders. Article 40 The Cardinal-Constables of Rome may be held responsible for not removing a Gonfalonier or Captain General who repetitively acts in ways unfit for an Aristotelian leader. Article 41 All discussions within the Congregation, concerning an active time of Peacekeeping or time of War, shall be subject to the right of confidentiality and the duty of secrecy. Article 42 All members of the Congregation shall not divulge sensitive information in relation to whatever rank or function granted by a mobilization. Article 43 All volunteers and members of the Congregation swear automatically, by the act of participation in a mobilization, to not divulge the daily orders given to them. Article 44 The obligation of confidentiality is applied to anyone who has access to the Congregation or to the mobilization orders, including Roman Cardinals. These previous three articles are not applied to the discussions submitted to the Sacred College of Cardinals. Article 45 The Creation of an In Gratibus Roman Army, by a member of the Episcopal Guard, a Military Religious Order, an Allied Aristotelian Order, or a lay faithful, must be approved by the Cardinal-Constables of Rome. Without the approval, such an Army is deemed unlawful and must be destroyed. Article 45.1 An In Gratibus Roman Army can be created in a Time of Peacekeeping or in a Time of War. It cannot normally be created in a Time of Peace, unless properly justified as being necessary to protect the faithfuls in particular circumstances. The creation of such an army will be announced publicly by the Congregation, with the proper justification written on the announcement if applicable. Article 45.2 An In Gratibus Roman Army must follow the orders of the Cardinal-Constables of Rome at all times. If part of a Time of Peacekeeping or Time of War, the army will follow the appointed Captain General or Gonfalonier of the Church. Article 46 The Creation of an In Gratibus Diocesan Army, by decision of the local Bishop or Archbishop, must be approved by the local Primacy as well as the Cardinal-Constables of Rome. Without the approval, such an Army is deemed unlawful and must be destroyed. Article 46.1 An In Gratibus Diocesan Army can be created in a Time of Peace or a Time of Peacekeeping. Thus, it is always created in order to fulfill a specific mission in the name of Aristotelian Friendship. The creation of such an army will be announced publicly by the Congregation, the announcement specifying the purpose of the Diocesan army. Article 46.2 The In Gratibus Diocesan Army is lead by the local Diocesan Constable. He must follow the mission approved for the creation of the said army. He must fulfill the mission, under supervision of the local Vidame and Episcopal Guards. If no ranking members are available locally, the supervision is done directly by the Cardinal-Constables of Rome. If joining a Time of Peacekeeping, the army will follow the orders of the appointed Gonfalonier of the Church. 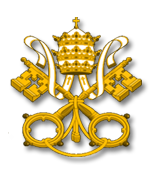 Article 46.3 An In Gratibus Diocesan Army can receive the Papal agreement of His Holiness from the Cardinal-Constables of Rome if the army is needed for a Time of War. It thus becomes an In Gratibus Roman Army and, in that case, the Diocesan Army rules are no longer applicable. The applicable articles are replaced by the rules whom concern the In Gratibus Roman Army. Article 47 All In Gratibus Armies can never act against the will of His Holiness, the Sacred College or the Congregation of the Holy Armies. These armies must always serve the interests of the Church and of the faithfuls. Given and confirmed in Rome by the Sacred College of Cardinals during the Pontificate of the Holy Father Innocent VIII, on the twenty-ninth of March, a Thursday, in the year of our Lord MCDLXVI. Published by His Eminence Hull de Northshire, as Archidiaconus, on the twenty-ninth of March, a Thursday, in the year of our Lord MCDLXVI.